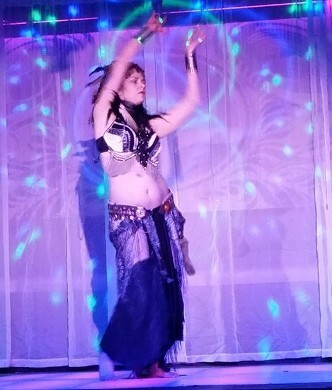 I am a Tribal Fusion Belly Dancer who has trained in the art of Belly Dance for more than fifteen years. Starting in traditional style, I fell in love with the movements and elegance of Belly Dance after watching a group of dancers and how they seemed to encompass the power of the dance itself. Infatuated with the movements, I determined that I must learn this form of dance. I decided to train myself in the movements and through various DVDs from Neena and Veena, Rachel Brice, Jilinna and others. I began to lose myself in the music and the movements came to me naturally. In 2005, after seeing the Bellydance Superstars live, I began to study Tribal Fusion through the teachings and performance of Rachel Brice, Zoe Jakes, Moria Chappell and Kami Liddle of ‘The Indigo’. Since then, I have blended my own style of dance incorporating the fundamentals of Belly Dance along with Modern and Hip Hop. I am currently on my 15th year of teaching at Dancemania in Jacksonville, Fl and have had the extreme pleasure of taking stage with The Bellydance Superstars, Zoe Jakes, and the many local dance troupes. My classes are for all who are interested in the art of the dance, but it is labor intensive. I suggest loose and comfortable clothing and a lot of water or sports drink as we do a lot of cardio in several drills.